There was a moment, while I was playing Polybius, that I lost touch with reality. In fact, it was a moment that happened more often than not during my time inside Jeff Minter's Psychedelic PS4 title. At first, I didn't know what to think of this intense and chaotic title, but it didn't take too long before I lost track of time. 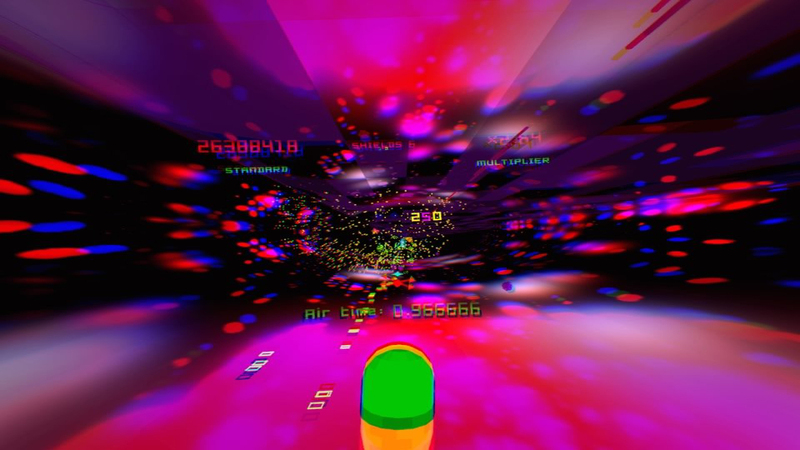 Polybius is a psychedelic arcade shooter with a bumping soundtrack, 50 levels, and support for standard play, VR, and even 3D television sets. Does this game manage to put a spell on you and lock you into its trance, or is this just a really bad trip? Time to find out. The PS4 game Polybius has no story, but the title itself carries an urban legend behind it, and there's no doubt in my mind that Jeff Minter used this as inspiration for the title. Knowing the story behind this name makes the game incredibly interesting as an experiment in the marriage of level design, music, light, and color. In 1981, it is said that an arcade cabinet called Polybius showed up in Portland, Oregon. It is said that this arcade machine attracted huge lines, and that people were utterly addicted to it. According to the urban legend, men in blank would often visit the arcade machines in the city who were supposedly there to test the psychoactive effects of the game. Player complained of amnesia, insomnia, night terrors, and hallucinations as a result of the game. 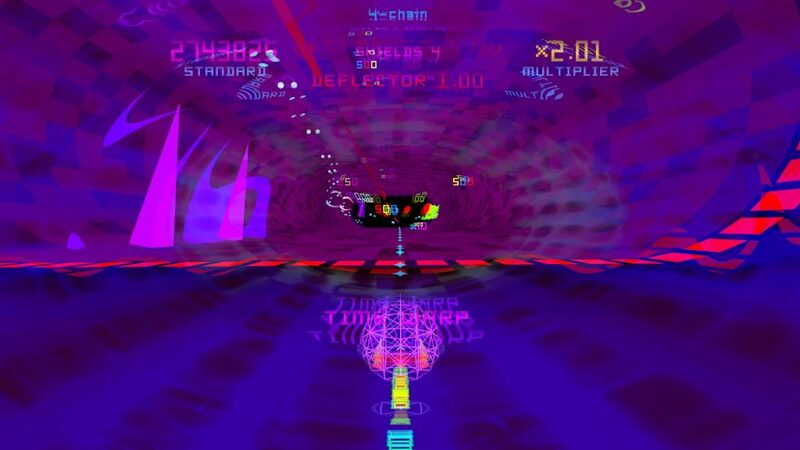 Around a month after its release, Polybius disappeared without a trace. Since then, no evidence of the game's existence has ever been found, but the urban legend has been spread across the internet. Don't believe me? Check out the Wikipedia entry. This urban legend has spawned theories that the government was using it as an experiment in everything from mind control, to recruiting the players with the highest score, and even sending subliminal messages. Whether or not you believe in the urban legend, the name has a story behind it, and that alone makes Polybius an interesting game. So, does it live up to the legend? When you first boot up Polybius, there's a very thorough warning that reminds you of the game's intense light and effects. People with sensitivity to light or flashing need not apply. You have to physically read both warnings and accept them before you get to the main menu. It may sound like overkill, but having been through Polybius' levels, I can say that it's a justified warning. I tried Polybius in the standard mode, in 3D on my TV, and in VR. The best experience, as you can probably imagine, is in VR, but 3D was a close second. Even as a standard 2D game, Polybius is most certainly worth checking out, but VR truly elevates the gameplay to insane heights. While the basic gameplay loop is the same, each of the levels manage to somehow find a new way to send you spiraling into a kaleidoscope of colors, sounds, and feverish intensity. There are several modes that adjust difficulty, but even on the easiest mode, you'll still be hard-pressed to beat every level on the first try. The game only requires you to survive and not lose all of your shields, but you can fire a stream of bullets at enemies and projectiles to earn points. There are also gates shaped like bull horns that you can fly through to increase your score and trigger things like speed boosts. They're not required, and running into them will damage you, but they offer a great way to keep you engaged throughout the levels. Of course, staying engaged isn't hard when it feels like the universe is exploding all around you. At first, Polybius simply felt like chaos incarnate to me. I thought it was cool, but it seemed like too much at once. It was overwhelming and I found it hard to find myself within it all as a player. This was merely a learning curve, though, because once Polybius clicked for me, it was like a dopamine switch has been turned on in my brain. I needed that next level. To recall the urban legend, I felt myself being drawn into the game. The addiction was real, and it made me want to stay in VR for just one more level. Once you get a handle on the chaotic design of each level, it becomes a test of reflexes and a entrancing journey all in one. I realize those sound like two opposite things, but as I was dodging, shooting, and passing through gates, everything just started to fit together. It really is a testament to the mind of Jeff Minter that this comes together into a cohesive whole. In the hands of anyone else, this would be a complete mess. If even one piece of the design was out of place, it would just feel like you're out of control and powerless to decide your fate. Instead, Polybius somehow manages to assault you at every turn with color, light, and intense music, all while keeping control firmly planted in your hands. It's something that must be experienced before it can be understood. The graphics in Polybius are very simple, but insanely effective. In fact, screenshots probably won't do it justice. Games like Rez come to mind as comparisons, but even that fails to truly capture the amount of color on display here. While the graphics are sharpest on a television, the VR version of the game isn't too shabby, and runs at a cool 120 FPS. As a result, I never felt motion sickness, which is a miracle given the game's intensity. Instead, my heart was racing, and my mind was riding high as all of my senses were treated to a symphony of color, sound, and constant gratification. Deep within all that chaos, Jeff Minter's vision shines through, and it's truly amazing to experience. I can't imagine that everyone who plays this game will love it. Some people may never get past that initial phase of trying to harness and understand the chaotic levels, and that's fine. For those who like these kinds of games, or simply want to ride a psychedelic roller coaster, Polybius is a trip you should absolutely take.